How Often Should I Clean my Carpets in Langhorne, PA? How often you should clean your carpets depends upon a variety of factors. According to the IICRC, the Institute of Inspection, Cleaning and Restoration, you should have your carpets cleaned AT LEAST 1 TIME PER YEAR. Families with children, smokers and/or pets should actually schedule carpet cleaning twice a year. If you have a large family and multiple pets, the IICRC recommends that you have your carpets cleaned quarterly. If you happen to live alone and have minimal foot traffic in your home, we have good news for you. According to the IICRC, once every 2 years is sufficient. If you are on a fixed income, this can help make carpet cleaning very affordable for you. Whether you live alone or have 7 children and 8 pets, we here at OxiGreen in Langhorne, PA want to be your affordable carpet cleaning company! We are proud to offer 100% green carpet cleaning. This means that our carpet cleaning agents are biodegradable and environmentally safe. You have our guarantee that no toxic chemicals will ever be used in the cleaning process. This is good news for your carpets and your family! Harsh chemicals damage the fibers of your carpets, wearing them down and cutting short the life of your indoor carpeting. They also leave a toxic residue, which can affect the health of your family and the air quality in your home. This is important to all of us, but especially families with small children and pets that like to play and relax on the floor. 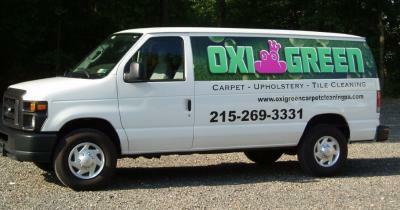 At OxiGreen in Langhorne, PA, we are very proud to be able to say that we are a pet and baby safe carpet cleaning company. Call us today at 215-269-3331 for a free in-home carpet inspection or to schedule and appoint. You’ll be glad you did.